Measuring the level of Total Alkalinity (TA) in your pool gives you a way to understand how susceptible your pool is to wild changes in pH. Low levels of TA will mean that the pH in your pool will be unstable. However, high levels of TA will also make it hard to maintain optimum pH, and could result in the pH drifting too high and causing scaling. The instructions on the sides of our kits are simplified reminders of the procedure for advanced users (see image below). 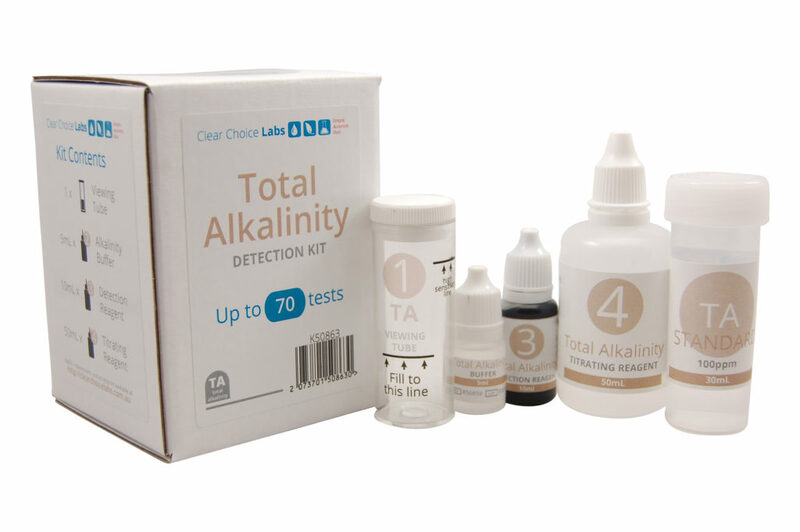 These are the extended instructions for the Total Alkalinity Detection Kits, that give you all the needed details on how to test your pool for TA levels. You can perform either the standard test using 10mL of pool water and conserve reagents, or you can opt for a high sensitivity test that uses 25mL of pool water, but uses more reagent. Rinse the total alkalinity viewing tube with pool water. Fill the total alkalinity viewing tube to the mark indicated (lower line). Add two drops of the total alkalinity buffer, and mix well. Replace the lid on the reagent immediately to extend the life of your kit. Note: if your Free Chlorine (FC) level is very high, use additional total alkalinity buffer to neutralize the FC. 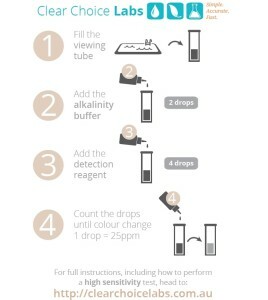 Add four drops of the total alkalinty detection reagent and mix well. The solution should now be green or blue. Replace the lid on the reagent immediately to extend the life of your kit. Note: If the solution is a red, yellow, or pink colour, then you may stop the test here, as your TA is 0. One drop at a time, add the total alkalinity titrating reagent. Mix between each drop, and count the total number of drops added until the colour changes (usually to red, but possibly also pink, yellow, or clear). If you are unsure whether the colour change is complete, add one more drop – if there are no more changes, don’t count the extra drop in your total. Multiply the number of drops by 25 to get your TA level in parts per million (ppm). Fill the total alkalinity viewing tube to the high sensitivity test line (upper line). Add three drops of the total alkalinity buffer, and mix well. Replace the lid on the reagent immediately to extend the life of your kit. 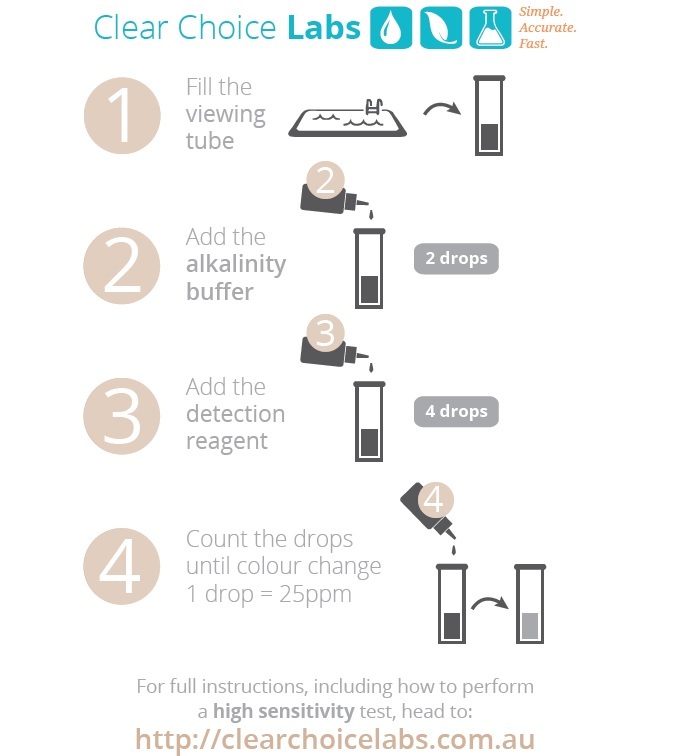 Add seven drops of the total alkalinty detection reagent and mix well. The solution should now be green or blue. Replace the lid on the reagent immediately to extend the life of your kit. Multiply the number of drops by 10 to get your TA level in parts per million (ppm). This entry was posted in Instructions and tagged TA, testing, the basics, total alkalinity.